So I just realized it's going to be super hard for me to do outfit posts now since the sun literally sets at like 4:30 now, since we turned the clocks back on Saturday. It's gonna be really tough trying to squeeze in a shoot, but I will try my best to make them happen. Anyways, today I have my current sunglasses collection for you all. These are not all of my sunglasses, but just my top 10 that I wear more frequently. I have other pairs that I never really wear, and found it pointless to include them. 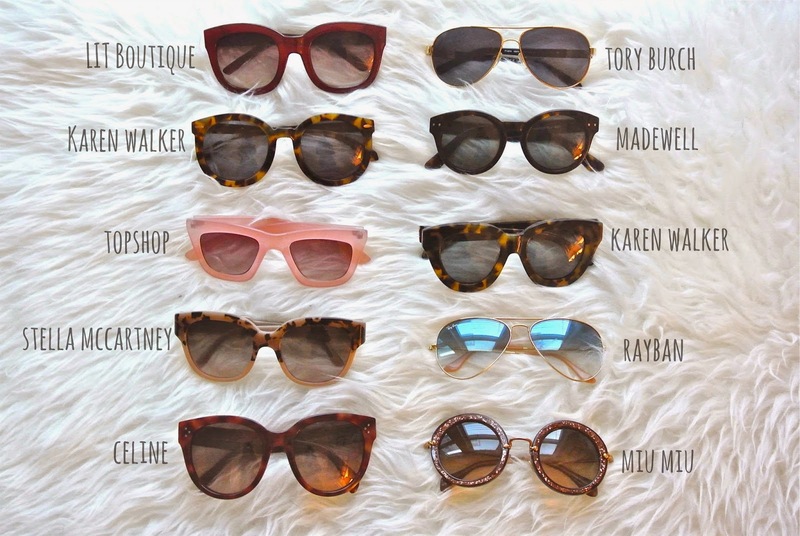 I love sunglasses so much, and I thought it would be a neat little idea to show you my favorites! Enjoy! What sort of sunglasses are in your current rotation? Love all of them! I've been on such a Ray Ban aviator kick lately thought. Thank you! Can't go wrong with a classic aviator!